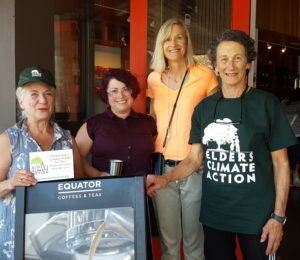 Elders Climate Action is an all-volunteer organization with minimal paid support staff. We welcome your years of experience, your desire to learn new skills, your concern for future generations, and your friendship. Work with others in your area to organize an ECA Chapter or group. Visit our Chapters section to learn more. Serve on one of ECA’s Planning Committees. Be an ECA Ambassador: Inspire, inform and engage other elders by reaching out to senior communities, organizations and environmental justice groups. Visit our ECA Action Tool Kit for materials you can easily access. Serve as an ECA Liaison to a Member of Congress from your area or state. Visit our Action Tool Kit and Core Principles and Policies sections to learn more. Provide a special skill to improve ECA’s effectiveness at advocating for our grandchildren and future generations. Are you a bookkeeper, website developer, writer, public speaker, media expert (social or otherwise), fundraiser, attorney, policy expert, photographer or videographer, etc, etc? We need your skills and talents. Help Us plan Local, Regional and National Events! We are currently looking for individuals to help plan and organize the next Elders Climate Action Day in Washington, D.C. in 2018. Help plan a meaningful, rewarding and successful gathering of the Elders. Join us and have fun while working towards climate action!